Stock # I19010HA, 4hk1-Tc Diesel Engine 317 Cid 5.19L 205hp At 2400 Rpm: 441ft-Lb, Automatic, 107516 mi. 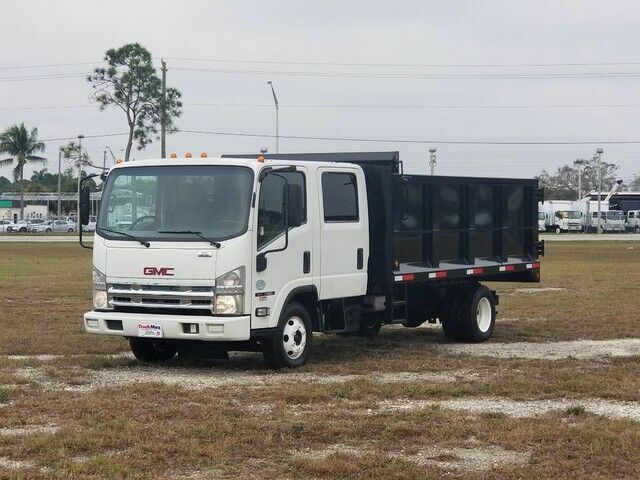 2009 GMC W4500 Crew Cab NG, GVWR14500, 5.2L 215HP diesel engine, 6-Sp automatic transmission, spring suspension, hydraulic brakes, steel wheels 215/85R16, 7-passenger grey cloth interior, AM/FM/CD radio, A/C, power windows and locks, L14' x W96" x H48" steel landscape dump, rear barn doors and manual tarp . 4HK1-TC diesel engine 317 CID (5.19L) 205 HP at 2400 RPM: 441 ft-lb gross torque at 1850 RPM. 4 cylinder 16 valve four cycle overhead cam turbocharged inter-cooled water cooled EGR valve direct injection electronically controlled common rail fuel system engine cruise control and idle up function. Oil level check switch and light. Engine Warning system with audible warning for low oil pressure high coolant temperature and low coolant level. Wheelbase 150" (381.0 cm) includes ladder type channel frame. Full C section straight frame 33.5 inches (85.1 cm) wide. Yield strength 44000 psi section modulus 11.89 cu.in. and RBM 523160 lb-ft/in per rail. Rear Suspension 9880 lbs. (4481 kg) capacity. Semi-elliptical steel alloy multi-leaf springs. Includes shock absorbers.